The Fiji Water Girl may have set the world on fire at last week's Golden Globes, but the truth is the bottled water brand is no stranger to the red carpet. In fact, after going viral less than a week ago, Fiji Water was again back at it as a sponsor of last night's Critics' Choice Awards. While the brand has sought to be more sporty with partnerships in recent months, the LA-based brand's bread and butter is the red carpet, serving up sponsorships at such institutions as American Film Institute, Golden Globes, InStyle Awards, Critics Choice Awards, Primetime Emmy Awards, SAG Awards, Tony Awards and Grammy's; among others. 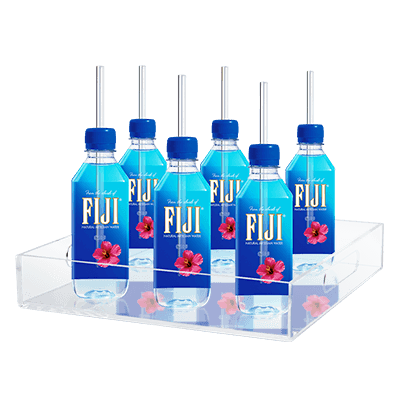 "We look for brand ambassadors who have style, confidence, and professionalism to represent [Fiji Water] with A-list celebrities," Clarence Chia, VP of marketing and e-commerce at Fiji Water told PRWeek. “When we’re on the red carpet, our goal is to hydrate celebrities with ‘Earth’s Finest Water’ and garner as much exposure as possible," Chia told The Drum.